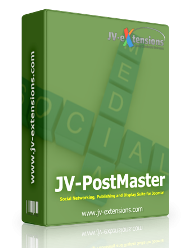 JV-PostMaster (JV-PM) is a social networking display and publishing suite for Joomla! 2.5 and 3.x using which you can post updates to multiple social network providers like your Pinterest, Twitter, JomSocial, EasySocial, LinkedIn, Tumblr and Facebook accounts (profile wall, groups walls and pages walls) and also send notifications to ping services like twingly, weblogs, google etc.. when Joomla! articles are saved or created. JV-PostMaster also provides modules to display latest tweets from your Twitter and Facebook profile, page and group walls. There is no need to purchase the JomSocial app separately. It is included in purchase of JV-PostMaster. You can define your own message for tweeting/posting. Article title, section name, category name, author name, article link, article meta description and article description are available as pre-defined tags for your custom message! Use the unique feature of Delayed Posting to save an article and delay its posting to provider accounts!. You can now go and make edits to the saved articles in this duration and ensure that the latest article edits are posted to provider accounts!. New! For Joomla articles, you can post custom fields to social media too!